This classic warhorse continued on its path of revitalization in 2005 with the return of 18 dedicated players who pushed pieces between Quatre Bras and Mont St. Jean. Eight of these players were returning to this contest of maneuver after more than two decades of inactivity with two of those playing in the semifinals. Highlighting this year was the addition of the 10-sided combat results table (CRT) that reduced the dreaded "A elim" in a 2 to 1 attack to 10% probability. Many aggressive players chose the French to capitalize on the CRT and greatly reduced play time. Play balance saw ten PAA and nine French victories. 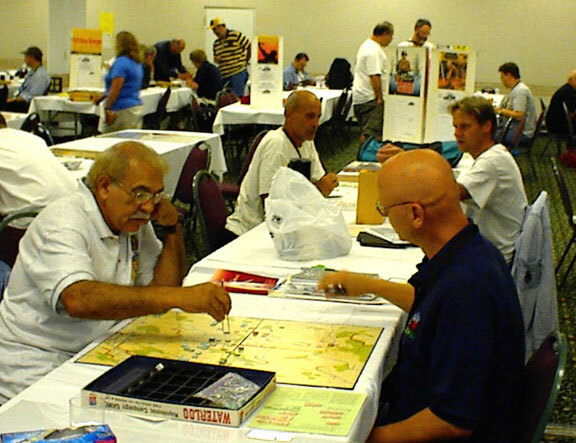 The free form play format provided players latitude in scheduling with Gary Dickson, Bill Morse, Marty Musella, and Bruno Sinigaglio as semifinalists. In the first semifinal game Bill's French launched a simultaneous assault on Bruno's PAA defending the heights south and east of Quatre Bras. Bill rolled well eliminating Bruno's 8-4 accompanied by two more D elims. Bruno, sensing an imminent PAA collapse made several unsuccessful 1 to 1 attacks, manfully attempting to stave off defeat, but the French superiority caused Bruno's Wellington to flee late on the 16th. In the second semifinal game, Gary's French tried the more traditional game of maneuver. A French force quickly crossed the Dyle River while the rest of the French assaulted Quatre Bras. Here Marty launched a series of PAA counterattacks while PAA reinforcements eventually eliminated Gary's maneuver force near the LaLasne River. Fighting raged throughout 17 June as Marty slowly withdrew awaiting the Prussian IV Corps. Gary's valiant French attempts to regain superiority with low odds attacks mostly failed so he bid Napoleon adieu late on 18 June. In the championship game, Bill's French tried to repeat his successful pincer attack on Quatre Bras. These attacks were not as successful as his previous attempt and Marty's PAA conducted counterattacks throughout 17 June slowly withdrawing to doubled positions. With no sizeable French forces maneuvering on either wing, the PAA and French slugged it out for several turns. Bill's Old Guard could not snare the victory and as the Prussians entered the field of battle, he sent Napoleon packing. Early intelligence reports indicate that more former players have vowed to return next year, so if you liked Waterloo when you were young, rekindle your love for this classic in 2006.